a book chick: "Paper Towns"
my take: I very much enjoyed John Green's The Fault in Our Stars, so when I saw this at Target I decided to see what else Mr. Green had up his sleeve. This, too, is young adult coming of age story: high school students with a bit of a (mis-matched) love story thrown in. The road trip scene is very funny ... Mr. Green got into the spirit of impulsive/lacking-frontal lobe high schoolers. There was a touch of mystery. A touch of high school hijinks. Very high school-y. Overall, a bit of a let-down after the high of Fault, but a read I think many would enjoy....just minus all the Fault tears. my source: Target ... I know, shameful. They have a pretty well-chosen selection. Hey! I'd like to have that job if I can't get the Costco gig. Interesting - sounds like this one has some similarities to the other John Green book I picked up on a whim to see what else he had going on. 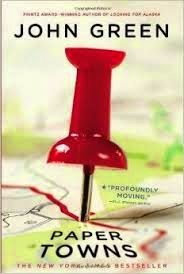 An Abundance of Katherines also has a quirky high schooler road trip and mis-matched love story. Also enjoyable, no tears, but not as great as The Fault in Our Stars.